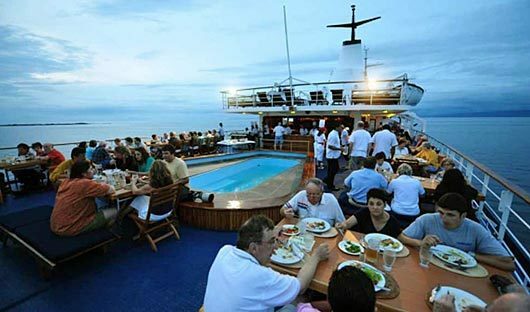 These ships have the space to afford large cabins and many ‘cruise ship’ facilities. They also have enough guides to afford all guests to go ashore (in groups of less than 16 – often as few as 12) at one time. Larger ships are generally more stable. 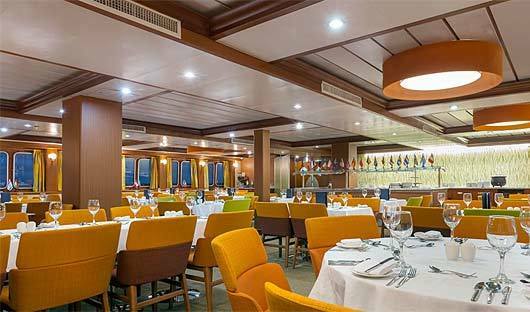 A superior expedition cruise ship, Santa Cruz II emerged from a complete renovation in 2015, refreshed, revamped and ready to provide an experience its guests will never forget. 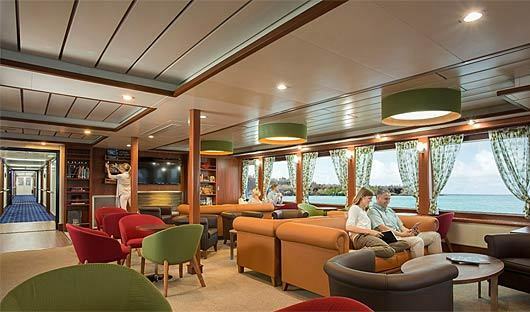 She is 71.8 metres long and, with 50 spacious air-conditioned cabins located across three decks, can provide families and groups of friends with a wide range of cabin styles and sizes from which to choose. 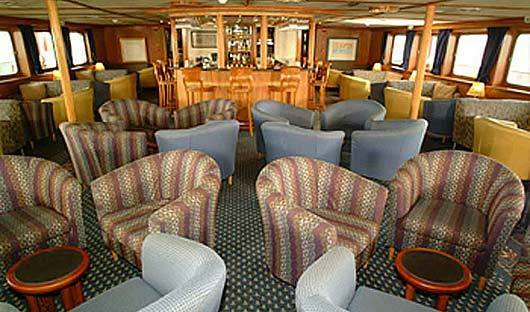 Elegantly appointed communal facilities include a dining room, a convivial lounge and bar, a fitness room and a spacious reading room/natural history library which is also used for presentations on geology, biology, and the history of the Galapagos . 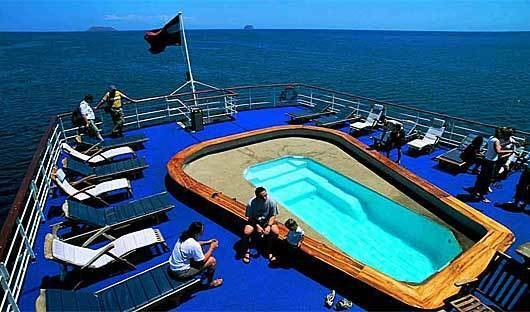 The sundeck has an open-air bar and a jacuzzi, as well as an observation platform, that is ideal for dolphin-spotting. Guests on board the Santa Cruz II also have access to the bridge where they can view state of the art navigation equipment run by the experienced captains. 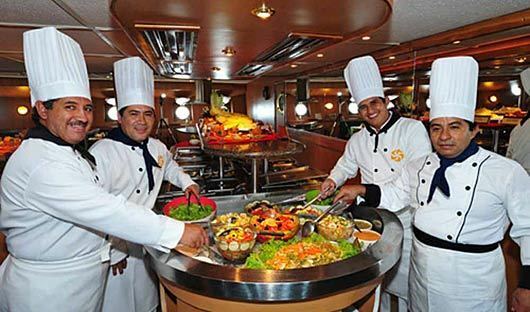 Guests will be delighted with the cuisine on board which is sourced locally (where possible). This includes freshly caught fish and seafood and locally grown fruit and vegetables. For ease of getting to shore and wildlife viewing Zodiacs are used and there is also a boat with a glass bottom to view the underwater wildlife. 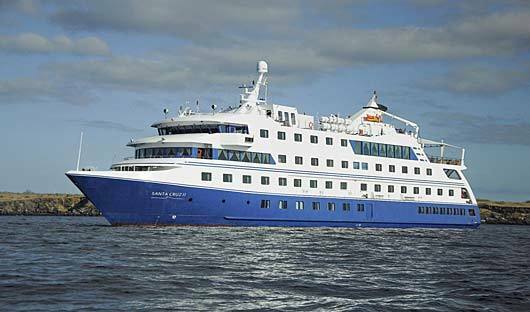 Sea kayaking and snorkelling are also available on board the Santa Cruz II. 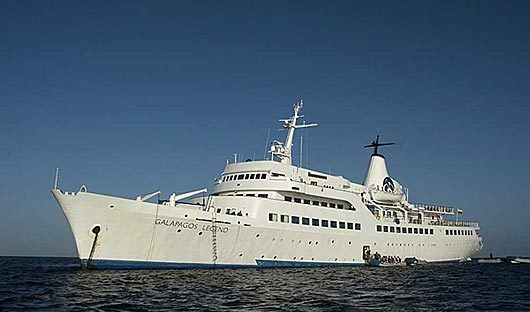 The Galapagos Legend offers all the amenities expected of a cruise liner while still providing the intimacy of a craft half its size. 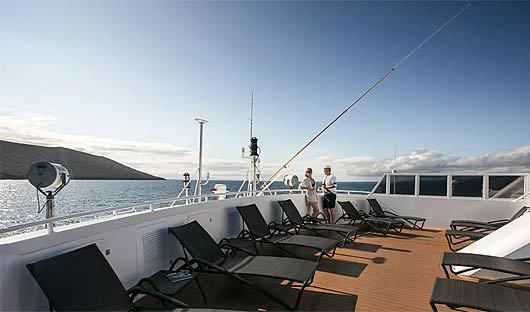 The 91-metre long, 5-decked expedition ship is a very good choice for those who prefer the services and stability of a larger vessel and also for families travelling with younger children who will delight in activities at Kids’ Corner. 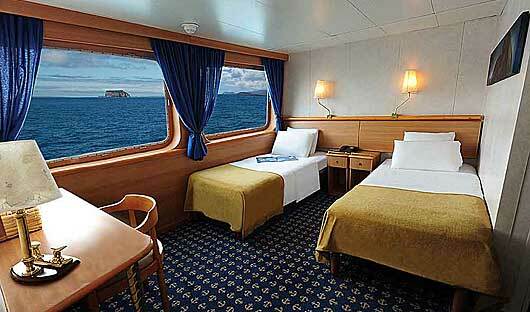 The Galapagos Legend has 57 cabins and suites, most with picture windows or portholes. 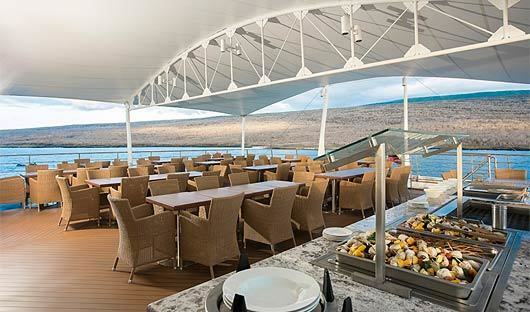 Facilities include spacious social areas, a large dining room, 24-hour coffee bar, and several expansive sundecks and observation platforms. A highly-trained crew of 80 and 7 multi-lingual naturalist guides will tend to your every need and, after a day of excursions ashore and in the Zodiacs, you might relax in the swimming pool or jacuzzi, curl up with a book in the lounge, or indulge in a soothing spa session. 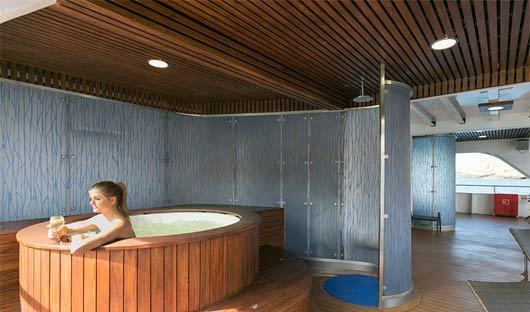 Accommodation: 57 cabins offering a choice of 5 different cabin types. 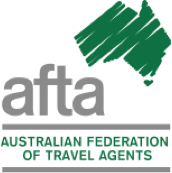 Cruise Durations: 4, 5, 8, 11, 12 and 15 day itineraries.